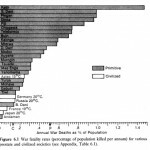 While trawling through my computer archives, I stumbled across this book review of Jared Diamond’s “Guns, Germs, and Steel” from five years ago. Overall, it’s a great book, better than his follow-up “Collapse”, which is also interesting – especially in the psychological aspects of “collapse”, like creeping normalcy and “landscape amnesia” – but far from the best in the genre (that would be Tainter). Having finished reading this book in November 2004, I came away impressed by its success in compressing 13,000 years of human history into a lucid and compelling explanation of why the rate of socio-economic development varied so significantly on different continents, without resorting to culturalist or racialist arguments. Jared Diamond succeeds spectacularly at proving why Eurasia had become by 1500 AD (the dawn of “Europe’s assault on the world”) the world’s most technologically advanced continent, far ahead of sub-Saharan Africa, the Americas and Australasia. In the final chapter, he extends the analysis to question why, within Eurasia, it was Europe that decisively overtook apparently better-endowed competitors (primarily China) within the next four hundred years and proceeded to “remake the world in its own image”. The underlying thesis in this work is that the environment is the primary shaper of human societies – hence the title of Chapter 2, “A Natural Experiment of History”. Connected with Diamond’s general aim of transforming human history into a scientific discipline, it explains how the Austronesians who populated the Polynesian islands, despite sharing common ancestors in Fujian, China, went on to produce remarkably different societies – agricultural and hunter-gatherer, technologically adept and primitive, oligarchic and egalitarian. 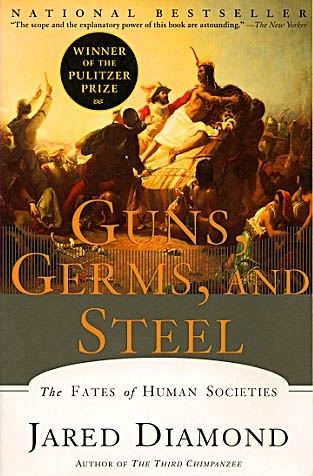 In the next few chapters , he contends that the rise of statehood, and the consequent, self-catalysing technological expansion (producing steel and guns, amongst others) and evolution of germs, was linked to the shift of food-production away from hunter-gathering, which first happened in Eurasia. This is because Eurasia was blessed in possessing an abundant number of nutritious and highly-domesticable crops such as wheat and barley in the Fertile Crescent and rice in China, and also because she possessed an area covered by the world’s largest and most varied Mediterranean climate in southern Europe and south-west Asia, and fertile soils and monsoon rains in China, India and Indochina. It is true that the Americas had corn, and the Africans sourghum – but the shift from hunter-gathering to food-production depends not on a single crop, but on a sufficient amount to offer a secure and balanced diet. The latter was lacking – for instance, of the world’s 56 large-seeded grass species, 32 were in the West Eurasian Mediterranean region, and only 11, 4 and 2 in the (geographically splintered) Americas, Africa and Australasia respectively. Nor were the extra-Eurasian continents especially suitable for pastoral economies. Of the world’s 143 big wild herbivores, only 14 are domesticable and only five – sheep, goats, cows, pigs and horses – can thrive across a broad range of climates. These discrepencies are due to the so-called Anna Karenina principle, which states that a variety of factors can null the chances of an animal being domesticable – their growth rates, problems of captive breeding, nasty dispositions, tendency to panic, and social structure. According to Diamond, of the 5 major and 9 minor domesticable animals, 13 are indigenous to Eurasia and one (the llama) is indigenous to South America. Africa might have animals that could be tamed (e.g. the elephant), but none that has ever been domesticated. The dearth of big animals in general in the Americas and Australasia is due to the fact that humans, with refined hunting skills, arrived there only 11,000 and 40,000 years ago respectively, and hunted all of them down because the animals had not had time to get used to this. 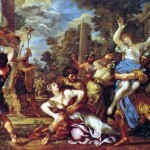 The “lethal gift of livestock” also gave Eurasian peoples germs (as most infectitious diseases originated from human interactions with animals – for instance, flu was derived from pigs and ducks, and measles, smallpox and tuberculosis all derive from cattle), and, consequently, stronger immune systems to the diseases. The resultant fact that the exchange of germs was virtually one-way largely explains successful European colonization of the Americas. Eurasia, because of it’s main east-west axis, fostered much easier transferals of agricultural and epidemiological breakthroughs. Crops and livestock generally move much more easily along lines of latitude than lines of longitude – thus, Fertile Crescent agriculture spread relatively quickly to southern Europe, north Africa, Iran, north India at a rate of 0.7 miles per year, whereas Mexican corns and beans crawled north to the Mississipi chiefdoms at 0.3 miles per year. The same applied to livestock – “The cool highlands of Mexico would have provided ideal conditions for raising llamas, guinea pigs and potatoes, all domesticated in the cool highlands of the Andes. Yet the northward spread of these Andean specialities was stopped completely by the hot intervening lowlands of Central America.” Whereas crops and livestock can travel relatively easily from Ireland to Korea (despite obstacles such as the Tibetan Plateau, Gobi desert and the jungles of southern India and Indochina), to travel the much smaller distance from Peru to the southern USA, one has to go north and transverse the Darien rainforests of the Isthmus of Panama (only 40 miles wide at its narrowest) and the northern Mexican desert. What applies to crops and livestock, must also apply to other forms of technology. Writing evolved independently in Sumer by 3000 BC and in Mesoamerica in 600 BC – however, whereas the former spread rapidly throughout Eurasia, the latter never reached the Incas or the Mississippi, where sedendaty food-producing civilizations might have made good use of it. Other examples in Eurasia included the wheel, door locks, pulleys, rotary querns, windmills and the alphabet, whereas the Mesoamerican wheel failed to reach the Incas in Peru. In conclusion, Eurasian societies were intially much better endowed than their American, African and Australasian counterparts not only in terms of crops and livestock, but also geographically and climatically. Eurasia’s primary east-west axis fostered linked the entire continent economically and epidemiologically, especially after the establishment of the Silk Road in Roman times. More productive agricultural bases, supporting much greater and denser populations, ensured a continuously generated food surplus, to sustain an evolving state appratus and the investment, development of technology and military machine that went with it. Eurasia’s quiltwork of states ensured a competitive environment that put an imperative on change that could not be replicated in the isolated societies of the Americas and Australasia. As a result, by 1500 AD no Native Americans had managed to progress to the Bronze Age and had not developed any deadly germs for the Spanish conquistadores to carry back home. Australia (mostly desert and marginal scrubland) and New Guinea (flat or hilly rainforest) were still in the Stone Age in the second millenium. Tasmania, with its 4000 hunter-gatherers, totally isolated for 10,000 years, had on the eve of its discovery by Europeans in 1642 AD the “simplest material culture of any people in the modern world”. As a result, these differences in development meant that, throughout history, but particularly within the last five hundred years, more advanced Eurasians were able to expand and appropriate the territories of native primitive peoples – examples include Chinese expansion into southeast Asia and the Pacific, the Bantu expansion into sub-Saharan Africa and the European colonization of the Americas, Australasia and Siberia. Diamond’s epilogue is concerned about why Europe, apparently one of the more backward super-regions on the Eurasian landmass as late as the High Middle Ages, nonetheless was the first to industrialize and dominate the world more fully in its heyday – from the middle of the 19th century to the middle of the 20th century – eclipsing ostensibly more powerful medieval empires, primarily China. The author again made use of geographic arguments, leaving aside institutional and cultural factors and relying heavily on E.L. Jones’ “The European Miracle” thesis. Now Europe is, in essence, a highly fragmented continent, separated by numerous mountain ranges (Alps, Carpathians, Pyrenees, etc) and small rivers (Rhine, Po, Oder, Visla, Danube), which support small, scattered population centres in their valleys. Numerous peninsulas and islands (primarily Iberia, Scandinavia, Britain, Italy) have traditionally counter-balanced potential continental hegemons (usually Germany or France). Europe has many different climates – Mediterranean to the south, maritime to the north-west and continental to the east, which produce different products (stimulating trade) and create natural ethnic boundaries (a phenomenom noted as early as the 5th century BC by the Greek historian Herodotus). China is almost the exact opposite – a huge, round piece of flatland, with its population concentrated in the great river valleys of the Yangtze and Hwang Ho (providing a huge and easily controlled source of manpower) and relatively uniform climatic conditions in its historic heartland (the tropical Cantonese south, dry continental Manchuria and Sinkiang and mountanous Tibet are comparatively recent acquisitions and even today are of peripheral economic importance). As such, China’s “connectedness”, to use Diamond’s term, encouraged political unity and autocracy; Western Europe’s fragmentation fostered a competitive states system, encouraging innovation and technological progress, and precluded the possibility of any single European state conquering the entire continent and stiffling it under a blanket of reaction. Hence, Columbus was able to find a financial backer in 1492 despite several previous rejections; however, court intrigues in Beijing brought to a permanent end Cheng Ho’s oceanic voyaging in 1433 and soon after closed dockyards across the whole Celestial Empire. As for the Fertile Crescent, intensive agriculture since 8500BC brought an ecological degradation that intensified due to the Mongol invasions of the 13th century and subsequent destruction of complex irrigation infrastructure. Two main arguments have been leveled against this book. The first is that China is not necessarily geographically more suited to unification than Western Europe, that the values of fragmentation are not necessaily greater than of unity, and most importantly that Europe owes its “miracle” more to its institutions – “the devolution of power implicit in feudalism and the scope for free thought created by the independence of the medieval Christian church from political control” (from David Frum’s review, “How the West Won: History That Feels Good Usually Isn’t“) – than to any geo-climatic conditions, which invoke the derogatory label of “historical determinism”. I’ll address these contentions one after the other. In his review of the book, J.R. McNeill in “The World According to Jared Diamond” wrote, “Europe may or may not have a geography that encourages greater fragmentation than does China’s (and I think this is open to question if one leaves out the Grand Canal, a man-made link). ” Apart from the evidence above, and the fact that the Grand Canal was constructed during the Sui dynasty (581-618 AD) and as such affected China for the majority of its history after the first unification in 221 BC under Shih-Huang-ti, we also know that the multitude of plains could support a might horseman army, which could exert political control over the huge, densely-clustered population centres of the Middle Kingdom. In fact this is the primary reasons why the Mongols (whose main strategic strength was in their speed and functionality without logistics) were able to conquer late Sung China, but wisely decided to stay away from Europe, where the land west of the Hungarian plains, containing only forests, mountains and areas of intensive agriculture, could not have supported a single tyumen. Hence, Europeans relied on decisively less mobile and more logistically demanding traditions of infantry and castle sieges, which made rapid conquests of vast areas practically unrealizable. Slightly later, McNeill writes that, “political fragmentation is not necessarily an advantage, indeed in some circumstances, such as the presence of a powerful and aggressive neighbor, it is a weakness”. The argument is made that although Europe was always a political quiltwork, it only started to become formidable after the first milennium. There are several weaknesses to this position – Europe, especially the “barbarian kingdoms” north of the Alps, was before the first millenium extremely backwards in comparison with any other major Eurasian civilization – China, Byzantium, the Arabs and India, but by the 14th century at the latest the qualitative gap had closed even with China. This suggests average rates of development were much higher in feudal Europe than in Asia. Besides, Europe never truly had a life-threatening neighbor – the Arabs were halted at the Battle of Poitiers in 732 by Charles Martel, the pagan Vikings were Christianized around the 10th century and it was Rus’ and Byzantium that took the brunt of nomadic assaults by groups like the Pechenegs and the Polovtsians (Cumans). McNeill draws an example with politically fragmented India, which however “did not generate highly efficient states and technologically precocious societies bent on expansion and conquest”. Admittedly, my knowledge in this area is shallow – and doubt the validity of that statement, given that India was the home of higher mathematics and that its port cities grew very wealthy off the trade of the Indian Ocean. Also, other factors may be more prescient at explaining this, such as India’s isolation from the main routes of the Silk Road, its stratified caste system (which discouraged innovation) and perhaps “Dark Ages” stemming from the plethora of outside barbarian invasions. Finally, David Frum contributed the third and most important point to this institutional counter-argument. I will quote from his review in extenso. At least in this century, the traditional account of the rise of the West has given credit to its propitious political and social institutions. That is not true only of recent times, when the institutions in question are liberal ones, but of more ancient history as well, when the West benefited from the devolution of power implicit in feudalism and the scope for free thought created by the independence of the medieval Christian church from political control. And that traditional account agreed, with varying degrees of certainty, that those traditions were more or less available to anyone else and would have more or less similar results wherever they were tried. Again, however, numerous holes can be picked in the text. The Church might have been independent of political control, but it was dogmatic in its views and consistently anti-capitalistic (e.g. the ban on usury). This is the reason so much commerce was in the hands of Jews in medieval Europe. Independent thought as such would have been confined to universities which began to be founded in 13th century, and these tended to support the monarch over the Pope. As for feudalism, it was based on the self-sufficient agricultural economy of the manor, economically isolated following the collapse of Roman order. Although I think a period of feudalism, which develops the idea of the contract (in addition to the Roman idea of private property) is a very useful precedent to capitalism, we must ask ourselves, why did it develop in Europe, and not in China? After all, China does have a long history of “warring states’ periods, including the post-Han economic downturn and fragmentation from 220 to 581 AD, which coincided with the fall of Rome. However, conditions in European were far more suited for the emergence of a feudalistic societies – firstly, “barbarian kingdoms lacked the bureaucratic and literate resources to rule directly over great areas”, unlike the Confucian bureaucracy which held China together until the twentieth century. Secondly, it had precedents in the fusion of Roman concepts of property with the Germanic “blood-brotherhood of the warrior-companians of the barbarian chief”, which was respectively partially and completely lacking in China. Last but not least, that same geographical fragmentation and relative lack of plains frustrated assertative European monarchs attempting to bring to heel some remote rebelling vassal, let alone maintain effective political unity. The second important argument was made by McNeill and contends that ultimately “the spread of useful species was usually a conscious act…determined by trade links, migration routes, and happenstance”. He argues as an example that a single line of latitude on Eurasia could vary greatly, from “the Gulf Stream-induced equability of western Europe, to the continental climate extremes of Kazakhstan, to the monsoon rhythms of Korea”, and consequently make the dispersion of animal and plant species very hard. He also attributes a lot of this dispersion as due to trade within Eurasia. Again, these criticisms have their flaws. For instance, jungles present much more of a barrier than continental plains or even desert, because of the greater number of diseases they harbor and because they are much more physically hard to pass. I think another crucial factor is that significant climate shifts, that have played a very large role triggering nomadic migrations and expansions within and out of the Eurasian Great Steppe, are lacking in rainforests, encouraging a more permanent existence. As for the second argument, it is downright irrelevant in the context of the book, because Eurasia as a continent only started to become contiguous with the genesis of the Silk Road during Roman times. By then, all the key crops and livestocks were already in place, that had generated the rise of the civilizations which were only then beginning to communicate with each other, albeit in rudimentary form, over thousands of kilometers. Having attempted to disprove two existing criticisms of the book, I would nonetheless wish to make a few of my own. One is how he rather hypocritically claims New Guineans are more intelligent than Eurasians, after just having had condemned white racist theories whose argumentative style in their specialization are similar to his in this instance. And I think he could have covered the scope of the last chapter of his book beyond an analysis of why Europe “won” and China “lost” – Middle Eastern societies were mentioned little (and the argument of environmental degradation was admittedly somewhat lost on me, considering that Egypt has managed to sustain a massive agricultural base from pharaonic times to the present day), and India and Russia not at all. (At least in the latter case there is a plethora of geoclimatic factors that negatively affected its development and covered in such books as Andrej Parshev’s “Why Russia isn’t America”). In conclusion, this is overall an excellent book which is a must-read for people in professions as varied as biology, geography, history, archaelogy, anthropology, sociology and economics, as well as the intelligent layman. Apart from the invaluable information and insights, it is written in concise, engaging and understandable language and one would be challenged to put it down after having read just a few pages.